Lentils, one the most important components of human diet throughout the history, had been known to people in Europe before they became a cultivated crop. The oldest archaeological remains from Fanchithti cave in Greece, dated back to 11.000 BC (M. Ljustina, 2008, p 42-43). Lentils are marketed in four general categories: brown, green, red/yellow and specialty. Each category has different varieties with unique flavours and textures but a similar nutritional profile. Brown lentils are sold in a package labelled simply as lentils with no designation of specific variety. The color of this variety can range from khaki brown to dark back and has a mild, earthy flavour. 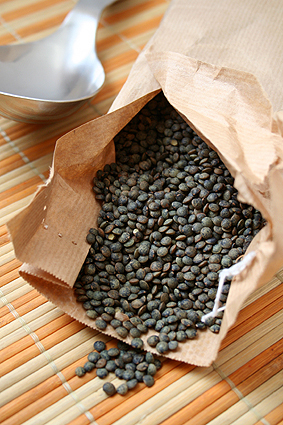 Green lentils are categorized according to size and they have a more robust and peppery flavour. Red/yellow lentils are usually cooked with spices to make Indian side dish, dhal. Their colour ranges from golden yellow to orange and red. Specialty lentils, is a category with many different varieties. The most common are Black Beluga and Puy Lentils. Tiny, black and round, beluga lentils are named for the caviar they resemble. When cooked they hold their shape well, which makes them ideal for salads. They have a rich, earthy flavour. Le Puy, green lentils is a P.D.O. product and the term can only be used to designate lentils that come from Le Puy in France. They claim to have gastronomic qualities that come from the terroir, in this case attributed to the area’s volcanic soil. They have a unique peppery flavor and they retain their shape after cooking. But there is another specialty variety much less known, coming from the Greek island of Lefkada. In the highest point of the island trapped in the mountains is the village of Englouvi. The inhabitants grow the crops of Englouvi lentils on the plateau of a mountain at an 900 meters elevation, this place is listed in FAO as one of the five protected areas of unique aesthetic-natural and cultural beauty of Greece. Samples of the Englouvi lentils are kept from the UN and the International Agency for Research on Dry Areas (ICARDA). This is because it is considered a very old crop. Grown in the same traditional way without any pesticides for many generations the seed remained unchanged through time. Given that the crop depends entirely on weather and it grows on this small piece of earth, the production is very limited and the price can reach up to more than 30 pounds for a kilo. Unfortunately since there is no law at the time to protect its origin, you have to be very careful while buying them. It’s always better to get them directly from a farmer. Their distribution takes place after harvest each August and is usually immediately out of stock due to huge demand. As for the taste, they say they are the most delicious lentils in the world. According to the U.S. Department of Agriculture’s National Nutrient Database, 1/2 cup of lentils contains about 9 grams of protein. Although the protein in lentils is classified as incomplete, meaning it lacks some of the essential amino acids, you don’t have to worry about it as long as you’re eating enough calories. There is a common misunderstanding that in order to get proteins from plant-based foods, you need to eat two different protein sources in combination, e.g., beans and rice. This is simply not true. Your body stores amino acids, so if you eat whole grains for breakfast and lentils for lunch, it's all fine. Unfortunately, this myth is still common and it is even being taught in health and nutrition classes and in medical schools. Aside from being a great source of plant protein, lentils are packed with iron, potassium, phosphorous, zinc, folate, niacin and are also rich in soluble fibre. By consuming them frequently you can improve your digestion, control diabetes, prevent cancer, maintain a weight loss, treat your anemia, and have a healthy heart and a better electrolytic activity. Lentils are also an great food choice for pregnant women. This is a classic Greek-Mediterranean recipe, easy to make and yet so tasty. There are many different versions of this dish, you can add any vegetables and spices you prefer adjusting the recipe to your liking. This lentil soup is naturally gluten free and a vegan dish, as it contains no meat or dairy. Clean the lentils from any possible little stones. Wash them, then strain them and put them into the pot with cold water. As soon as they boil, strain them again. In a large pot over medium heat add the olive oil and the onion. Chop the carrots and celery into small slices and add them to the pot and sauté. Thinly slice the garlic and add it to the pot along with the bay leaves. Stir and add the chopped tomatoes and let them cook for a while. Add the lentils and the vegetable stock. Cover the pot and let them cook for 45 minutes over medium to low heat. Always add the salt at the end in order not to harden the lentils. Serve with a tablespoon of EVOO and a tablespoon of wine vinegar or fresh lemon juice (both ways can also increase iron absorption).